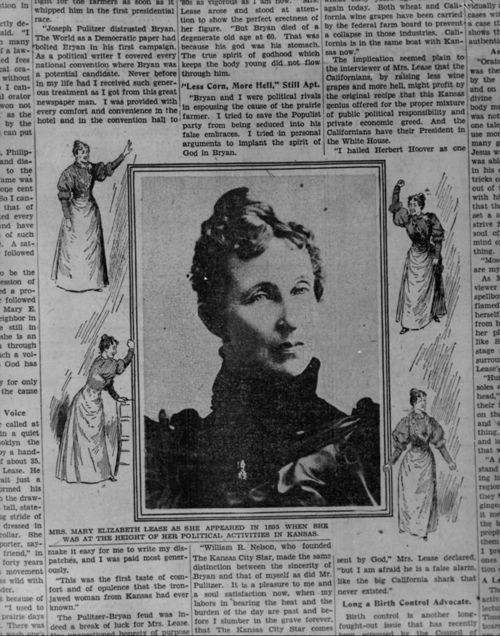 A portrait of Populist "Mary Elizabeth Lease as she appeared in 1895 when she was at the height of her political activities in Kansas." The illustration was copied from the March 29, 1931, issue of "The Kansas City Star" newspaper, and is surrounded by a portion of an article written about Lease. A passionate speaker within the Populist Party, Lease, 1850-1933, urged Kansas farmers to "raise less corn and more hell" in their resistance to big business.